"We have a taste relationship." Nightcrawler writer/director Dan Gilroy reunites with Jake Gyllenhaal for his third feature, Velvet Buzzsaw, another bleak contemporary thriller dissecting one aspect of society's modern ills. This time around, Gilroy mines the highfalutin Los Angeles art scene to set some truly offbeat, blood-soaked satirical horror genre antics amidst a killer cast. Gilroy uses mixtures of perceived low art forms to only superficially comment on the commodification of contemporary artwork and how they are critiqued. Its surface-level commentary feels somewhat toothless and overly explicit as a plethora of morally compromised people—all involved in the corrupt industry of high art somehow—profit off the life's work of others and seem to deserve their horrible fates. Zawe Ashton as Josephina grounds the film as we follow her unscrupulous rise as an agent out to make her own name as an art purveyor and tastemaker. Her involvement with Gyllenhaal's Morf Vandewalt—an influential, endlessly sardonic art critic with some truly pretentious one-liners who knows everyone—is fairly amusing. It's an eccentric performance (to say the least) as he really commits to the act while reaching in many different directions while loosely connecting the looming horror elements. Morf seems to revel in being involved the lives of the artists whom he critiques before slowly unravelling at the madness around him. Both Rene Russo and Toni Collette are coldly hammy as powerful art dealers amongst an impressive row of cast members who add a sense of a lived-in world despite the inconsistent jump in tones. How Gilroy combines the contrasting, heavy-handed satirical bits (think Art School Confidential) and slow-build terror never quite fit together. It's a noisy (albeit precise) thriller that waits patiently to show its hand and the increasingly out there supernatural elements. The messy, unredeeming characters are mostly arrogant fools who exist to be put into peril or killed off in inventive ways à la Final Destination while we question what material actually deserves our laughs or ridicule. 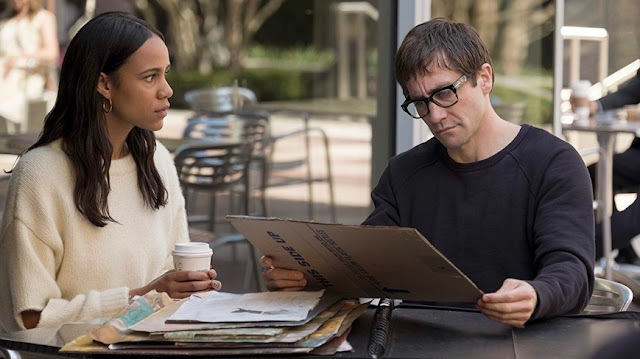 Sadly, Velvet Buzzsaw ultimately feels like a rather anaemic genre sendup of contemporary society mining its ripe material of the modern art world. It inconsistently mocks and satirizes our notions of high and low art before switching into its more conventional horror beats. Velvet Buzzsaw will be available for streaming on Netflix starting February 1st.